18th October, 2014: The Final Boutdown! I’m not an early bird (I tried it once; the worm is nothing but cold floors and rush-hour traffic). Setting my alarm to 6:15am could only mean one thing – a derby day! Not just any derby day, it was the day of the North East Division triple header. There were two remaining games to be played to decide which teams would progress to the final. 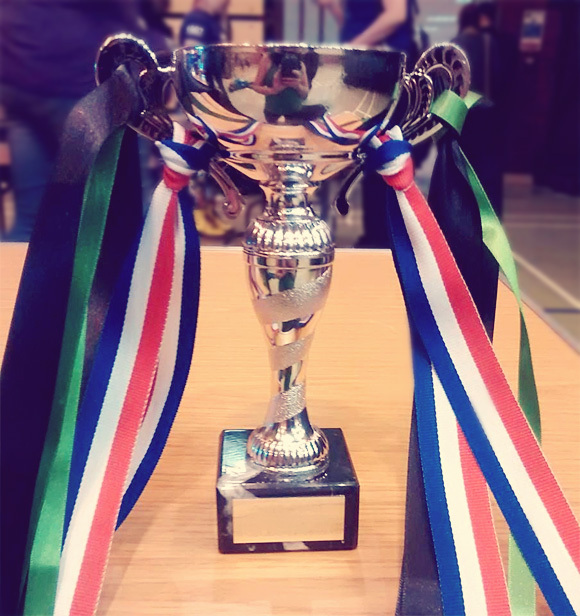 Romsey Town Rollerbillies were undefeated after four games and had secured 1st place, leaving Oxford Roller Derby and Nottingham Roller Girls to battle for 2nd and 3rd. 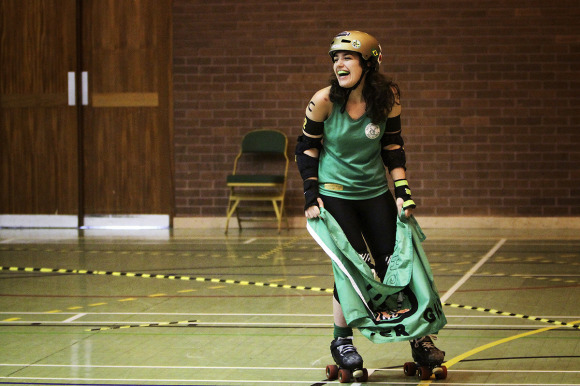 With NRG set to play in the last game of the day they were up against an old foe, Wolverhampton Honour Rollers. Last time NRG met WHR they won 229 – 138. With this in mind, and 2nd place within reach, the pressure was on. 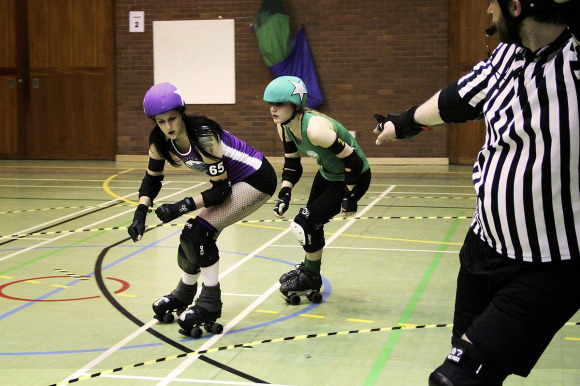 The first game saw RTR win their fifth game (Rebellion Roller Derby 91 – RTR 269). Next was the decider; if ORD won, NRG also needed to win to secure their place in the finals. The resulting score: ORD 244 – Vendetta Vixens 83. It was game on! The first rolling whistle marked the start of what would be a heart-pounding 60 minutes. With fierce determination both teams lined up, and it was time for me to change from official ‘Team Grey’ to the Kelly Green I have come to love and know as home. WHR were the first to score points on the board but NRG gained momentum with big scoring jams from the likes of Damndrea, pulling the team ahead. With 10 minutes to go and a score of 70 to WHR’s 24 we began to entertain the thought that NRG might actually win: maybe (I never like to count my chickens). 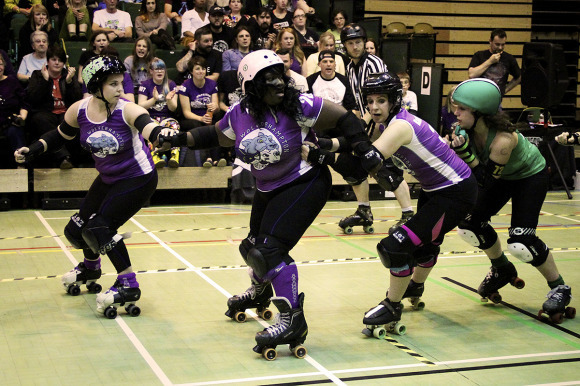 Formidable walls and big hits from WHR’s Oppress-Her saw the NRG jammers endure more and more soul-destroying recycling as we watched the margin increasingly close; 34 -70, 38 – 77. Finally, after a power jam to WHR we entered half time NRG 78 – WHR 53. It was the longest half-time I had ever sat through. 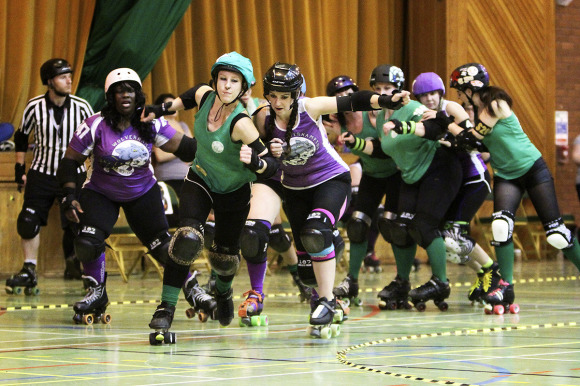 The second half started with WHR’s jammers taking full advantage of three power jams and the score levelled at 80 – 80. The noise level went through the roof! Excellent jamming from WHR’s Jeneral Grievous and NRG’s Hell ‘n’ Back saw lead change, after lead change, but the spell was finally broken with multiple power jams against NRG. WHR got the wheels rolling (and the stars passing) and before our eyes put 65 points on the board in the time NRG put 10. Neither team were willing to go down without a fight, however, and in three minutes NRG put 23 points on the board bringing the scores to NRG 140 – WHR 168. To deafening cries NRG called a time-out and forced a last jam. ORD’s greater points differential of 332 to NRG’s 130 entitled them to a definite place in the final, making NRG 3rd place winners in the North East division of the tournament!